A U.S. Border Patrol truck enters the Port Isabel Detention Center, which holds detainees of U.S. Immigration and Customs Enforcement, June 26, 2018, in Los Fresnos, Texas. The separation of families at the U.S.-Mexico border caught the attention of the world and prompted mass outrage, but it's only a small part of the Trump administration’s immigration policy. The government is working to harden the system on multiple fronts to curb immigration, carving a path around various court rulings to do so. The administration is seeking to lock up families indefinitely, expand detention space, tighten asylum rules and apply more scrutiny to green card applications. 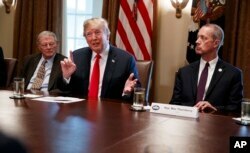 FILE - President Donald Trump speaks during a meeting with Republican members of Congress on immigration in the Cabinet Room of the White House, June 20, 2018, in Washington. That’s because two court cases in California restrict what the government can do in carrying out hard-line immigration policies. One requires the government to release immigrant children generally after 20 days in detention. The other has banned the separation of families and placed the government under tight deadlines to reunite parents and children. 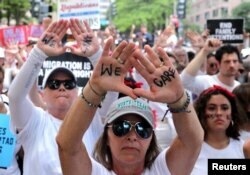 FILE - Immigration activists rally as part of a march calling for "an end to family detention" and in opposition to the immigration policies of the Trump administration, in Washington, June 28, 2018. Since taking office, the administration has ended protected status for hundreds of thousands of people from countries recovering from war and natural disasters, slashed the number of refugees allowed into the United States and said it would seek to strip the U.S. citizenship of those suspected of cheating to get it. And applicants for green cards and other immigration benefits are facing longer waits and more detailed questions. 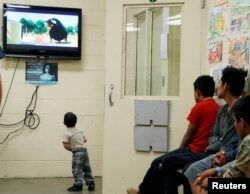 FILE - A detained immigrant child watches a cartoon while awaiting the arrival of U.S. first lady Melania Trump with other young detained immigrants at a U.S Customs and Border Patrol immigration detainee processing facility in Tucson, Arizona, June 28, 2018. Immigrant advocates said ankle bracelets and community-based programs can be used to ensure immigrants attend court hearings where a judge will determine whether they’re allowed to stay in the country or should be deported. They said it’s much cheaper and more appropriate, since detention isn’t meant to be punitive but to ensure court attendance. Rather, they said, resources should be devoted to beefing up the overwhelmed immigration court system to help those genuinely fleeing violence get their cases heard quicker and weed out those who aren’t.